Greg Brown, Atherton Tablelands producer; Warren Jonson, Wombinoo Station. 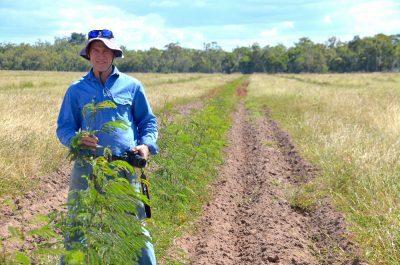 INITIAL grazing trials of the new leucaena variety Redlands are showing promising results for both psyllid resistance and palatability, a field day last week was told. 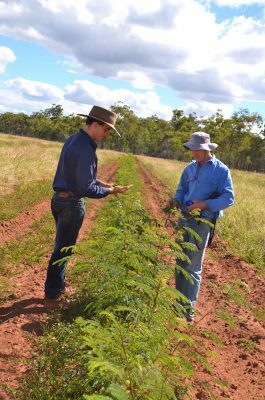 Redlands is a hybrid variety of leucaena developed by University of Queensland scientists with Meat & Livestock Australia funding. Leucaena is a highly productive feed source for cattle but existing varieties such as Cunningham and Wondergraze are susceptible to attack from psyllids, which cause significant productivity losses and have prevented its establishment in more humid northern environments. Crowd at the Whitewater Station field day. The new Redlands hybrid is psyllid resistant, which is expected to open large areas of northern Australia to leucaena establishment. Two landholders in Central Queensland – Carnarvon Pastoral Company and Leucseeds – have been awarded seed growing contracts, and both are expected to have commercial volumes of seed available for producers to purchase later this year. Lab tests have shown that Redlands has similar protein levels and digestibility to existing commercial lines, such as Cunningham and Wondergraze. 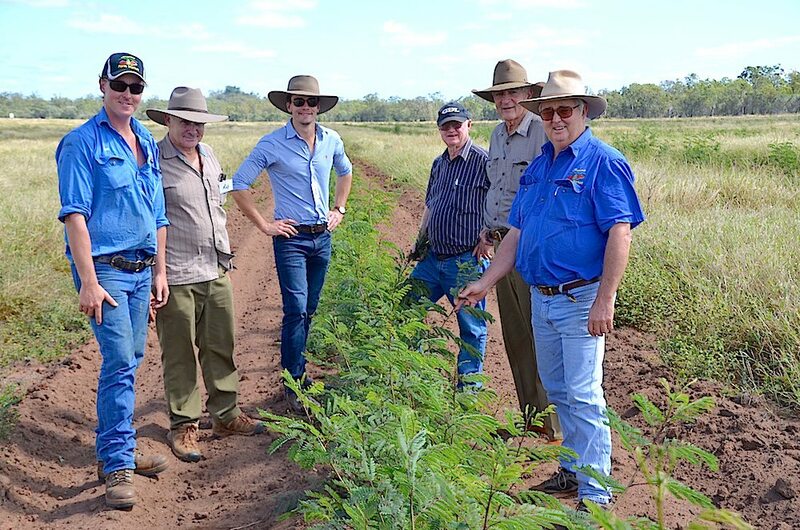 Trials in north Queensland are now seeking to answer questions about whether the new variety will be as palatable, productive and able to produce comparable or increased weight gain as existing varieties. 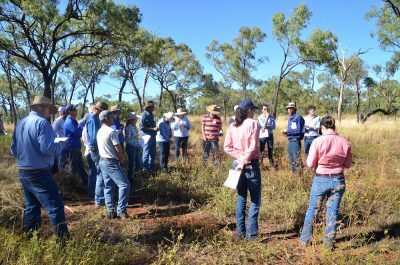 About 30 cattle producers attended a field day at two trial sites last week being overseen by Queensland’s Department of Agriculture and Fisheries (DAF), where Redlands and other varieties have been established to identify potential productivity gains and demonstrate establishment techniques. Small-scale grazing trials over the past two years at a site on Whitewater Station, Mount Surprise, have demonstrated Redlands’ superior psyllid resistance. “It was pretty clear that after psyllids had done their work on the Cunningham and the Wondergraze, that it made the Redlands look so much better,” DAF’s Craig Lemin said. “The owners (Tom and Christine Saunders) could see it just walking into the paddock, you could see the new green growth on the Redlands. A one-hectare site was established on Whitewater to compare the relative palatability of psyllid-resistant breeding lines with existing commercial varieties. The trials have demonstrated that cattle initially preferentially chose Wondergraze and Cunningham, but all varieties including Redlands were well grazed. A further 40 ha demonstration site was established at Whitewater with Wondergraze on lightly timbered basalt country, with the view to understanding if leucaena can be established in timbered areas given the restrictions applied to tree clearing in the region. The demonstration site now been successfully established with leucaena planted in early 2016. Currently the leucaena has produced variable results, which the addition of Sulphur fertiliser is expected to improve, but Mr Lemin said it is demonstrating that Leucaena can be successfully established in timbered country. Some costings were also shared at the field day, based on the trial work QDAF staff are undertaking and from the experiences of producers they work with. Broadly speaking, establishment costs have so far been around $480/ha on red earths (assuming already cleared), about $345/ha on red basalts (lightly timbered or already cleared) and about $475/ha on frontage country (assuming already cleared – more expensive here due to cutter-bar operation for weed control). A much more comprehensive grazing trial is also set to take place next year, following the successful establishment of Redlands and Wondergraze on a 61 hectare site at Pinnarendi Station, Mount Surprise, which was planted earlier this year. The site is divided into eight paddocks – four containing Redlands and four containing Wondergraze – which is on track to support a liveweight gain trial set to commence in 10-12 months time. “The best is now a metre to a metre and a half high, and that should see it through now until the first storms,” Mr Lemin said. MLA has funded the establishment phase of the trial, and will review the progress in coming months to decide whether funding for the liveweight trial will go ahead. Should it proceed, the trial will be fully replicated to ensure that any differences that occur between the cattle grazing on both varieties can be attributed as much as possible to the different varieties themselves. The liveweight trial is expected to involve dividing a uniform group of Brahman type steers into eight even cohorts for grazing in eight paddocks (four on Redlands, four on Wondergraze) for a period of eight to nine months. Leucaena has been established on estimated 200,000 hectares of grazing country, predominantly in Central Queensland. The Redlands variety is expected to open up 1.5 million hectares of northern grazing land to potential Leucaena establishment in future. 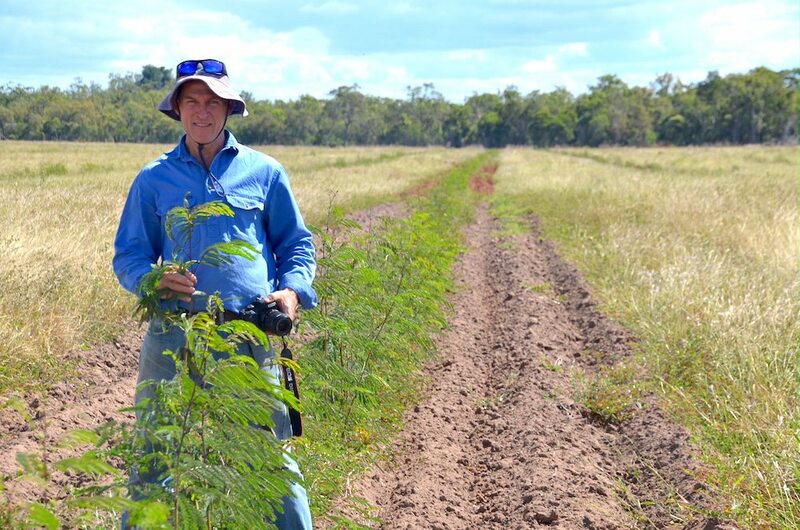 Information from previous trials suggest that in the far northern Queensland environment, annual liveweight gains of 240kg should be achievable with Leucaena. DAF’s Rob Caird and Craig Lemin inspect leucaena for psyllids.